EWD3 is designed to protect doors, windows or even drawers. It senses opening and vibration to inform a user, if the attempt to break-in happens, and measures home temperature. The installation of EWD3 is extremely easy. Remove the plastic tab from the battery and add the device to the security system with one click using Eldes Utility. Mount EWD3 to the door or window with 2 screws or a duct tape. Additional wired zone allows to connect third-party wired devices, including flood sensors, roller shutters or magnetic door contacts! Innovative Eldes wireless technology enables users to reach an impressive up to 3 km range in open areas. Thick walls and multiple-store properties are no longer an obstacle. You will not need to change the batteries every few months – EWD3 contains amazing up to 5-year battery life! EWD3 is designed to expand security system’s capabilities and protect entrances 24/7. 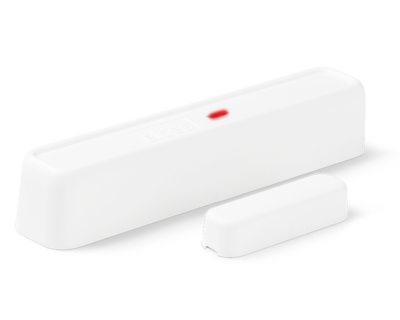 Integrated shock sensor warns the user about attempt to break a door or a window. Adjustable vibration sensitivity won’t let your noisy neighbours trigger the alarm. EWD3 can be used for home automation, e.g. the system can turn off the heating while windows are opened! * The operation time may vary under different conditions. ** Depends on region.